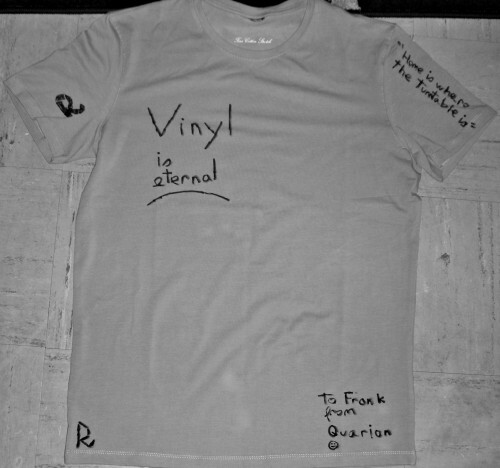 Frank, I spent so much time on this tee, using my non-existing drawing skills to the max...you better wear it! Phew, it really feels like eons since I’ve sat down and wrote some nonsense for our blog…then again, it’s not like I’ve been lazy: I’m known as der Pressemann, the one in charge for all the release sheets, party infos, Reels descriptions and basically every written text that is related to Retreat, so there has been some stuff to rant about, but fair enough, my last proper blog entry was in November. Back then, I was moaning about the tough Berlin winter but now, believe or not, the sun came back! My brain still has trouble processing this new information and I was indeed training to live in this Ice Age for the rest of my life (dressing up with 5 layers, being really cautious not to slip on the road, mumbling instead of talking so that my lips don’t bleed)…but hey, the ice is gone, the birds are singing and the days are getting longer so I guess I can ditch those adamantium gloves. So what’s new at Retreat HQ? Well, in case you didn’t notice, we have a new record out entitled “Treats Vol.2” which is getting some major airplay. It’s a hot split EP with two cuts from Session Victim and 1 track from myself. You can read about it here and there but also just make up your own mind by listening to it. Session Victim are now busy working on RTR06 but if you’re a fiend for their groovy cut-up approach, i would strongly recommend that you check out Matthias Reiling‘s excellent “Das Gespenst Von Altona” on Giegling. This Mini-album from the talented producer who makes up 1/2 of Session Victim has Funk stamped all over its 3 House tracks and 5 Hip-Hop Instrumentals. Being the ageing b-boy that I am, my preference goes to the 5 little gems: intricate yet bouncy beats that seem to be tailormade for MC’s like DOOM or Kool Keith. Hot ish! In fact, if you’re in Berlin tonight, be sure to check Matthias out at Farbfernseher, it’s about to become pretty steamy in this little place!